Having spent the bulk of Saturday (coincidentally Arsene Wenger's 62nd birthday) in Brooklyn for the NYC Arsenal Supporters event at Three Kings Tattoo, and getting some Arsenal ink done myself, I woke Sunday full of hope. Sure, Arsenal have had a good home record against Tony Pubis and his pack of mental defectives in recent years, and yes we've put together a decent string of results of late, but I've learned that nothing can be taken for granted with Arsenal, so hope hasn't always been the emotion of the day. Stoke usually prove a tricky opponent for Arsenal, as their specialty is, was, and may well be for the foreseeable future, our Achilles' heel: set pieces. They've also exploited us with Rory Delap's long throws into the box (and inherent time wasting with shirts, towels, oilcloths, shammies, etc.) and Route 1 brand of football in the past. But coming off of the late winner grabbed by Aaron Ramsey in Marseille, confidence was high among supporters and, one would imagine, the players as well. I will admit I wasn't terribly comfortable seeing Chamakh's name on the team sheet as a starter. I think we can all agree that Robin van Persie is overdue for a day off, but Arsenal have relied so heavily on his offensive contributions that it's hard to see where our goals would come from when he's not playing, and the Moroccan's inability to find the back of the net with anything approaching regularity in about a year is worrisome indeed. Still, the fans were once again behind the team, a welcome change this season that I do hope will continue, and we got underway. The first half wasn't full of as much flare, panache, and end-to-end action that a match with Stoke generally promises. The angry dwarf managing the Potters employed what I like to call the Ashley Cole strategy: ten men behind at all times. This proved effective at clogging passing lanes and denying Arsenal space to do anything with the ball when they had it. Neither did Stoke look very dangerous at the other end, despite dominating possession in the opening minutes. The breakthrough came when the hero of Marseille, Aaron Ramsey, clipped a ball over the defense for Gervinho to slot past Begovic, giving Arsenal the 1-0 advantage. Ramsey and Gervinho nearly scored (and clearly handled the ball) on very similar lob from Ramsey earlier in the match, so it was interesting to see Stoke succumb to it twice, and well done to Rambo for sticking one right over MasterBlaster to set up the Ivorian. It didn't take long for the good vibes and endorphins from the Arsenal goal to be washed away in negativity. Referee Lee Mason, who really had a shockingly bad game, allowed a Stoke free kick outside the Arsenal area. The resulting kick was pinged around the Gunners' box without clearance until the giraffe on ice skates stuck it in the back of the net. That it came off a terrible officiating decision is a sore point, but the way we defended it wasn't good enough, and we deserved to concede, even to Peter Crouch. That we were denied a pretty good shout for a penalty when Chamakh was hauled down in the box by Wilkinson stung a bit worse, but I think we'd resigned ourselved to Another One of Those Days with Mason at that point. An Arteta cross was narrowly headed away from Chamakh in front of goal by Upson; a few minutes more passed before halftime finally arrived. We did look a bit more competent and threatening in the second half, and seemed a bit more assured on the ball, but couldn't penetrate the Stoke back line of 10 men. Around the hour mark, the Dutchman's day off was ended early as he came on for Chamakh, and immediately made an impact. On the ensuing short corner, Robin nearly picked out Koscielny at the far post. 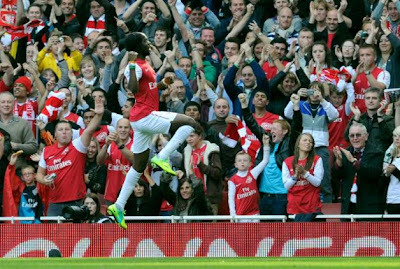 Moments later, Gervinho took a ball on the right wing down to the end line and cut it back for van Persie, who snuck it past Begovic at the near post to give the advantage back to Arsenal. not long after, Arshavin (on for Walcott) put Gervinho through into the box on the left. The Human Easter Island Statue bore down on goal before picking out van Persie, who put enough force on his shot to get it through Begovic and into the goal. The Dutch Master had scored 2 goals in 9 minutes, and Gervinho had a goal and 2 assists for Arsenal in a 3-1 win. There would be no further goals from either side, and the remaining 20 minutes were dominated by Arsenal, who refused to allow Stoke back into the match. Apparently this was the first time in 11 months that Arsenal have won in the Premier League following a Champions League match, so I think we'll all be relieved to see the end of that particular streak. I'd love to comment on Citeh's thrashing of United, but I find it difficult to appreciate since City is simply following the Chelsea model of "THROW MONEY AT IT! BUY EVERYONE! HAHAHAHAHAHAHAHA!!!" I love watching United lose, but I take no joy in the successes of a team whose business model sounds the death knell of every team not wholly owned by wealthy oil barons. What is advantageous to Arsenal is that Chelsea not only lost to QPR, but saw Jose Bosingwa and famed Arsenal-killer Didier Drogba sent off, incurring 3-match bans for both. Being that there didn't appear to be any grounds for appealing either sending off, that's two of the Chavs' first XI who won't be in their lineup when we play Chelsea next Saturday, which is certainly good new from an AFC perspective. I'm looking forward to that one, albeit warily. Lastly, cheers to everyone who attended the Arsenal tattoo event at Three Kings Tattoo on Saturday. 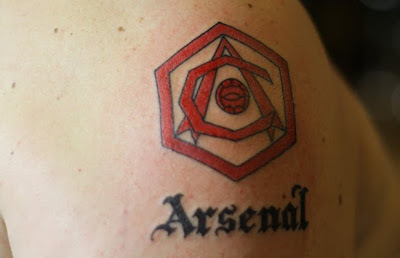 over 140 Arsenal tattoos were done, and for many it was their first tattoo altogether. Whatever happens on the pitch, I'm proud that we have such a great fanbase here in NYC, and I'm prouder still to be a part of it. Big thanks to Alex McWatt and everyone down at Three Kings for making this happen, and I'm sure with the fantastic work that was done, plenty of those 140 will be coming back soon.